Anyway, here’s where we are going: an arugula pesto for the plate, a beautiful tomato (don’t even reach for the salmon-colored golf ball), and a nice filling with chopped arugula, walnuts, bell peppers, red onion, bread crumbs, Parmesan cheese, and a few other things. And let’s dress up the plate with tendrils of lemon zest, a scattering of arugula flowers, and (why not, since they are in bloom in pots out on my deck?) a few nasturtium flower petals. Note that the filling is not cooked! Dice or mince the vegetables small enough for you to stay happy when you bite into the raw pieces. Rinse and dry the arugula leaves. (Option: I used arugula from my garden, so I also pinched off a few of the flowers and put them in a shallow bowl of water to use later for garnish. They are perfectly edible and taste just like the leaves. Also, if you have a nasturtium or other edible flower in your garden, add a few of its petals to the bowl (not the whole flower!–just the petals). Put one cup of the arugula in a small food processor. (Be sure to save the other 1/2 cup for the filling!) Add half the minced garlic, a pinch of salt, and a grind or two of pepper. Pulse a few times to get a coarse paste. Set the pesto aside for use later. Zest the lemon. (Use a zester/striper if you have one; otherwise, use a regular vegetable peeler and cut the wide strips into skinny ones.) Save about half the strips for garnish and mince the rest. 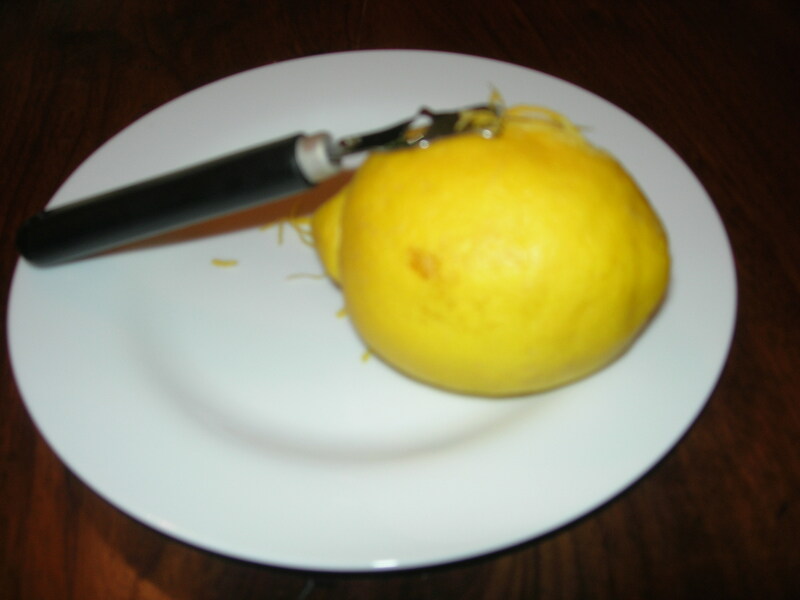 Then cut the naked lemon in half and juice it. 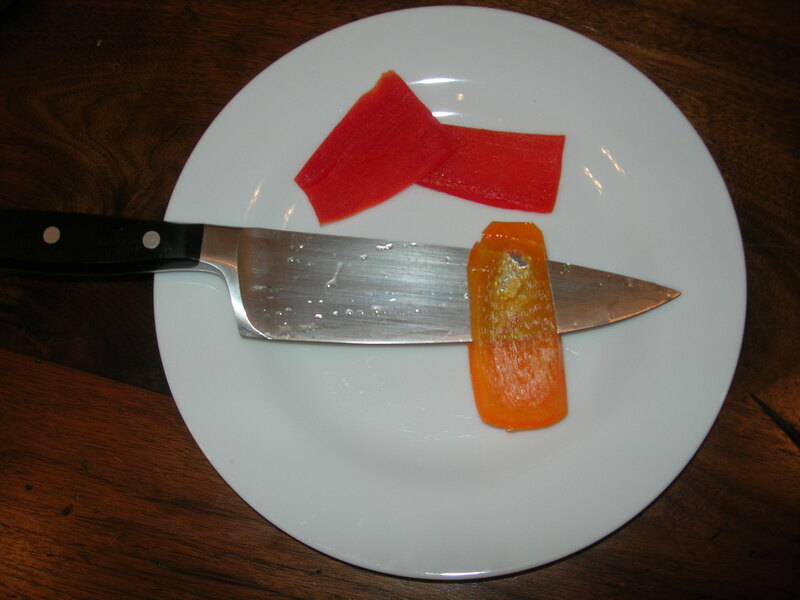 Prepare the peppers by using a sharp knife to skim off the inside m embrane (the whitish layer). This gives you a deeply colored, glossy surface that is very pretty. Dice the pepper (or peppers, if you are using a mix of colors; I used red and orange). Dice the onion. Save about a tablespoon of the diced peppers for garnish. Chop the walnut pieces coarsely and divide into two portions. Chop up the remaining half-cup of arugula leaves. Grate the cheese. (Use real parm-reg! The stuff from the green can doesn’t taste good.) Since it costs an arm and a leg, I tend to grate it coarsely so that I can savor its taste separately! Now make sure that you have put aside the items that we need later for garnish: half of the walnuts and half of the grated cheese for a topping on the tomatoes; and the pesto, a little bit of the diced pepper, half of the lemon zest (the strips), and the flowers for the plate. In a small bowl, combine all the remaining ingredients for the filling: the breadcrumbs, the remaining half of the minced garlic, the remaining diced pepper and onion, the chopped arugula leaves, the remaining half of the chopped walnuts, the remaining one tablespoon of olive oil, the lemon juice and minced lemon zest, the red pepper flakes, and a pinch of salt and grind of pepper (or to taste). 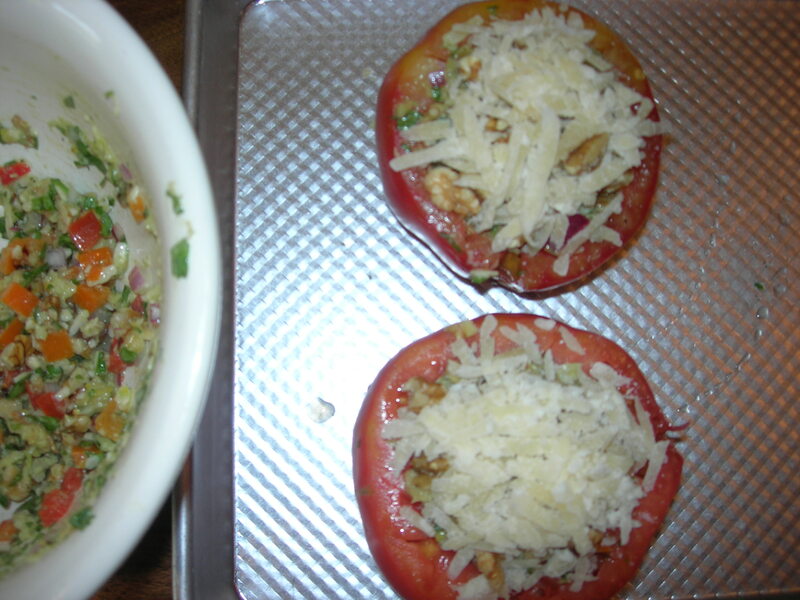 Gently press the filling into the cored tomatoes, ending with a slightly rounded top. If the filling felt dry at all, drizzle each with a small amount of olive oil (about a teaspoon). Then sprinkle the surface with the remaining walnut pieces and cheese. It’s fun to play with your food! Make a puddle of the arugula pesto on the plate. (I’m not happy with my pesto; it has separated a bit. I’ll make it a few more times in the next couple of weeks to see if I can figure out what I did wrong.) Place the tomato next to it. Dry the flowers and petals, if you are using them. Sprinkle t he plate with the garnishes: bits of pepper, lemon zest, and flower petals. If you like, you can add a slice of crusty bread, and maybe a light dessert like a sherbet. (This is actually a pretty hearty lunch; you won’t need much else.) Even with my beginner’s problems, this was a tasty dish. Serve it and EAT! 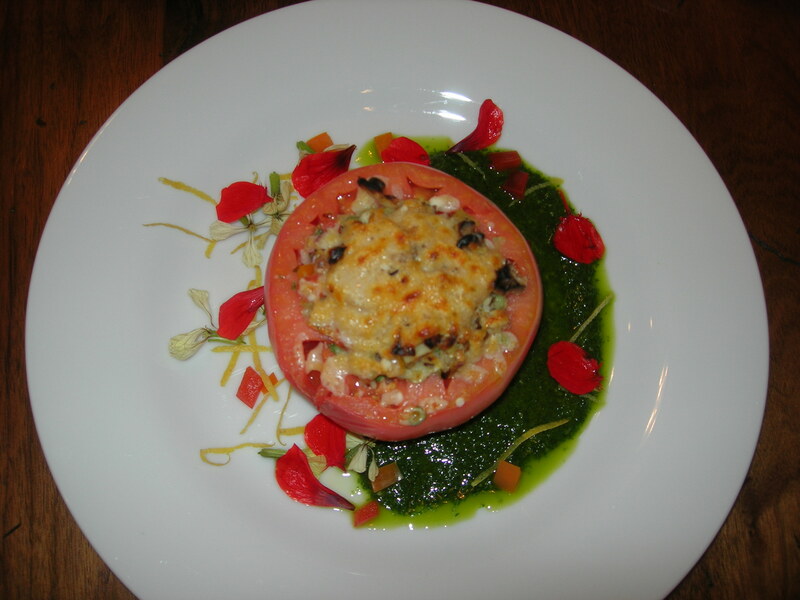 This entry was posted in Recipes and tagged arugula, arugula pesto, bread crumbs, cloves garlic, edible flowers, flower petals, pesto, red pepper flakes, stuffed tomatoes, walnuts by judyramey. Bookmark the permalink.